Have a new website and want to get stuck into local SEO for the first time? Or have you been online for a while, but looking to boost your local customer base? We provide you with all the information you need to excel in local SEO. 3.1 What are local SEO reviews? The applications for Local SEO have been consistently on the rise as the use of the mobile internet continues to grow. Local SEO focuses on providing results that are relevant to the searcher, based on their current location. Google will take the search enquiry and promote the best local results to the top of their rankings. Being savvy and making the most of additional applications like Google Places for Business, Google+ Local and other listing information apps, can turn local SEO into a valuable tool for your business and customers local to you. For businesses new to the online world, it’s difficult to build a customer base on a minimal budget. Good news though – achieving great results in the home market could be just enough to fuel sustainable growth. We pulled together this digestible local SEO checklist to help your website. Believe it or not, most companies don’t need to conquer the world in order to be considered successful. Achieving great results in the home market could be just enough to fuel sustainable growth, and in some cases the geographic area of primary importance might not be larger than several city blocks. It all depends on the business plan, and the same strategic outlook needs drafting in the plans to be translated into a multi-pronged SEO campaign that places an emphasis on local customers. The background thinking isn’t too hard to comprehend in this case. Customers often use search engines to identify the nearest reliable provider for the product or service they need, and proximity is a key factor influencing purchasing decisions in this scenario. A person might travel extra couple of miles to receive superior service, but probably not much more than that – so who cares if people from another continent regularly find your website. Most businesses are better served with a campaign that aims to build local ties and ensure high placement for all relevant searches originating from the same area. You should regard search engines as your allies in the quest to win new customers and attempt to align your business tactics with their preferences as much as possible. The best way to do that is to complete the registration process and initiate direct interaction with the system, since this will allow you the greatest degree of control over your ranking. Google is the obvious choice since it has the greatest global penetration and offers the best support mechanisms, but other engines such as Bing or Yahoo could also make sense in certain cases. In most parts of the world, registration procedure isn’t really an obstacle that should prevent you from maximising the impact of your web-based marketing. Google pays a lot of attention to weed out fake accounts, so the verification process might take a few weeks, but it doesn’t require any specific knowledge and you basically need to follow the basic instructions to complete it. This simple action will earn you an instant SEO boost, and your business will start appearing across all Google properties, including the uber-important interactive maps. Becoming a verified partner with the leading online search companies puts you on the business map – quite literally. Your potential customers would like to be served locally, but that doesn’t limit them to collecting info from local sources only. In fact, a large portion of incoming traffic on your website might come from people intending to visit your city in the near future and doing preliminary research in advance. To ensure you get as many hits with this group, you need to be listed on as many trusted online reference sites as you can. You can’t expect strangers to know where to look for you when they arrive, so you should post metaphorical signposts leading straight to your door. Websites like FourSquare, TripAdvisor or even Yellow Pages are frequently used to mine for info about a particular location, and it is mandatory to get your brand in there by all means necessary. They combine broad appeal with high authority, and as such represent obvious targets for your SEO link building tactics. The exact list of most popular portals varies from country to country and you would be wise to find out which ones make the most sense for your locale, so you can prioritise them. The next step in the hierarchy should be online outlets specific to your home region, since such sites are very likely to attract a high concentration of your potential customers. For example, leading media websites covering your city or thematic portals related to your line of business are great places to start, but there is no need to stop at them. There is a rising number of websites that strive to be seen as ‘go-to places’ for local shopping or dining advice, so you could easily place your listing with them, too. Perhaps not each and every one of them will be a big-name site, but you will secure some additional traffic and that’s all that counts. At this level, a little bit of initiative should get you tremendous results, since most of those websites are actively trying to maintain an accurate database of local businesses. If you call them and let them know what you are doing, they will probably be glad to add you to their listings, since this serves a mutually beneficial purpose. Just remember to use exactly the same company name and contact data that’s already posted on the search engines, or otherwise you could create a royal confusion that damages your SEO positioning, and in turn diminishes your revenues. The previous part of this guideline is applicable to virtually any company making the first steps on the internet, as it includes only basic techniques that barely depend on the industry you are active in. However, it is essential to understand what keywords are integral to your success and to dedicate most of your budget and attention to them. Search engines assign a lot of importance to inbound links coming from established websites, so you can score ‘bonus points’ for recommendations if you manage to get connected with the most influential sites in your niche. One effective way to do this is to ‘spy’ on your competition. For example, you can find which companies currently occupy the top spots on searches relevant to your business and try to emulate their link network as much as you can. By doing a simple Google search with the exact name, address and phone number of your competitor, you can see which external sites they are using for promotion, leading to their high ranking. Once you find out what your rivals are doing to outrank you, it becomes simple to follow in their footsteps and join them on top. The best side of the online medium is that you can easily track feedback and react to it. User reviews are a good indication how well your company is doing in the marketplace and whether certain aspects need to be changed in order for customers to be completely happy. Even better, they are a free form of customer research that provides plenty of valuable insight into the inner workings of your business, enabling you to adjust the practical details and make long-term plans. If your website doesn’t include a section for user reviews, you need to add it as soon as possible. Knowing what works and what doesn’t can save you a lot of time and money, while the customers will be pleased to see some of their suggestions were taken seriously. Internet can be a great tool for customer relationship management, all you need to do is to stay flexible for ideas coming from the outside. You may already have most of the components of a killer business plan in place, and user opinions will allow you to recognise the most valuable building blocks and place additional emphasis on them. It could be a product that gets everyone excited or a certain special promotion that went unexpectedly well – you never know until you listen to the customers. Maybe you like the way your site is organised, but it can certainly be tightened up to deliver even more functionality. This is particularly important for startup companies that need to maximise their conversion rates and make the most of their traffic, while typically having smaller websites that shouldn’t be too hard to organise efficiently. You worked very hard to get the potential customer to visit your site and you don’t want him to leave just because it’s too difficult to find the online order form in your drop down menu. The content of the website should also be frequently updated and reflect the evolution of your business. Every new product or service you introduce should be immediately announced online, along with all relevant info that customers might want to know. Practical information must be presented clearly, without forcing the visitor to dig too deep, while you also don’t want to overwhelm them with a flurry of details too soon. Once again, a dialogue with your customers should point you in the right direction and tell you what to add or remove, and there is nothing wrong in seeking professional help if you feel you are unable to judge your own site objectively. There are countless factors that are actively influencing your Google rankings and it’s hard to keep up. Local SEO reviews, including testimonials and social media comments, are crucial indicators that reflect your customers’ sentiments about your business. Take control of your local reputation as we look at how reviews are important in helping your business and SEO efforts. What are local SEO reviews? Reviews refer to a testimonial or review that was given by a customer about your business, and published online. It’s always good to have positive reviews of your business, but keep in mind that not every review will help to improve your SEO. Only reviews published in certain locations will help your site’s rankings. Improving local search results means you need to have local reviews published about your business. One of the most important places to publish these reviews is on your local Google+ page. After this, other sites like Yelp or Yell are also great options that carry a lot of weight. You should aim to have as many positive reviews as possible published on these pages to help boost your local SEO rankings. Customers can also leave reviews about your business on other platforms like social media, blogs and business forums. But these entries will have little effect on your SEO as they are not included in Google’s search algorithms. But they are not completely irrelevant; potential customers will still read them. Reviews are typically a short overview of a customer’s experience working with your business. It can often also be accompanied by a rating, a score out of 10 is an example. Reviews with a score and written content will carry more weight than simply a score rating alone. Local reviews of your business is important for many reasons. They affect your Google ranking within local search results and this in turn, will affect whether a visitor clicks on your link or not. This will have a direct influence on their decision to purchase your goods or services. Reviews are almost just as important as backlinks for your local SEO strategy. Keep in mind that even if you rank on top of search engine results, users may still choose to click on a competitor’s website if they have more reviews published. People want to know that they choose a reliable business or product and reading reviews will give them that peace of mind. If many users rate your business as excellent, it indicates that you can be trusted. This minimises the risk of working with you, which is what a user looks for. Google places a lot of value on local reviews published on your Google+ page. Google feels that these results can be trusted more than others published on a range of third party sites. When your business shows up in Google’s search results, it will show the number of reviews your business has received just under your listing. However, the average rating that Google shows up may not be the exact mean average, and lots of small businesses complain about having 4.8 averages from eight 5 star reviews, as an example. This is because it is very difficult for Google to compare between a business with fifty 5 star reviews and a couple of 3 stars, and a business with ten 5 star reviews. It can be assumed that eventually the second business will get some worse reviews, and Google tries to anticipate this by extrapolating and weighting the mean with the number of reviews. What can you do as a small business to get around this? Not very much unfortunately, other than keep encouraging your customers to leave reviews, and increasing the number of reviews you have. As the number of reviews increases, Google’s algorithm will give a truer mean, and will extrapolate less. If you do feel that you’ve received an unfair rating, you can flag the review. Reviews on your Google+ page are sorted by default in order of how ‘helpful’ or relevant they are. Google uses a number of aspects to rank this, including the length of the review and how many people have indicated that it’s helpful. Some businesses will naturally get reviewed more than others, so you cannot always compare the number of reviews you get with other businesses. It depends on the industry you are in, and the location you operate in. And also remember that not all businesses have customers that use the internet. You should aim to get as many honest reviews as you can, on an ongoing basis. There is no set number of reviews that will help your SEO ranking, as this is determined by various factors. After your request, follow up in a few days’ time to see if you can get people to submit a review on Google+ for your business. It’s a great way to boost your SEO and also improve your trustworthiness online. Unfortunately, there are many search engine myths out there and it’s hard to separate fact from fiction. Your rankings could be boosted by simply knowing a few of these SEO elements. We’ve pulled together a list of the most common local SEO myths and busted them so you don’t have to. 1.If you delete your listing in Google My Business, it removes the listing from Google. Business owners will sometimes ask how they can get rid of duplicate listings on Google. People sometimes claim the duplicate listing and then log on to their Google My Business Dashboard to delete it. Google then brings up a warning, asking if you really want to delete the listing. The truth is, when you delete a listing here, it only makes it unverified, it will still show up on Google Maps. 2. If you don’t claim your page it won’t be listed anywhere. If you’ve received a message that says your business is not currently verified and you should claim it, you may be one of the business owners that worry your business won’t be listed. People who call you with this message are likely not experts in the industry. Even if you don’t verify your listing it will still be ranked. It might just rank better if you add more information to it. 3. Professional or practitioner listings on Google can be deleted for being duplicate listings. It’s not uncommon for Google to create listings for public-facing professionals like doctors, lawyers, realtors, etc. But the owner may not want these listings to exist. In these cases, Google will remove the listing on one of two conditions. First, the professional should not be public facing. Secondly, the business only has one public-facing individual. If you have your own law firm, for example, you can be a solo practitioner and can merge the listing with the one for the office. 4. Posting updates on Google+ will help boost your rankings. Your posts will not commonly be seen by people unless they specifically search for it. When it comes to local listings, Google doesn’t include your Google+ page in these results. Although you should not completely ignore Google+ as a social platform, it won’t make your rankings increase significantly. People often see good results with organic SEO but don’t see their business showing up on local listings. They then wonder if they can hire an SEO professional to handle their local SEO. The truth is that local SEO is not something that you can separate from organic SEO. Local listings and organic SEO is very closely connected. If you have a good budget available, you should get an SEO company that knows that these two are connected and handle your SEO as a whole. 6. Google employees know best when it comes to which ranking signals you should focus on. Google employees may be knowledgeable about a lot of things, but they don’t have any incentive to spill any secret tips on how you can rank top within Googles result pages. Some of them have said that duplicate listings can fix themselves, Google+ postings can help your rankings, and by altering your business description you can rank better in the 3-pack. These are simply not true. 7. Setting a huge service area will rank your business for all the additional cities and towns. If you have a service-based business, you can set a radius around your business to show where you offer your services. It indicates how far you are willing to travel to help a customer. Some business owners choose to set this radius very large as they believe it might help them to rank higher. Setting your service area larger will not result in better rankings. You will likely still rank in the area your business is in. 8. If you relocate your business, you need to close your old business listing. This is not true. If you mark your listing as ‘closed’ you will have a big label that says ‘permanently closed’ and this will show up when someone searches for your business. All you need to do is log into Google My Business and change your address or contact details. If a duplicate unverified listing exists, make sure you mark it as ‘moved’. You do not need to delete any old listing as it may look like you’ve closed down. 9. Google will publish whatever information you add in Google My Business. Google gets information from various sources, so it’s not only coming from your Google My Business dashboard. You can edit the information to reflect your business accurately, but it will still be verified against third party data, information on your business website, and Google Maps. So Google does not only get its information from Google My Business profiles. 10. Social media cannot help your local SEO efforts. Content from social media websites like Facebook and Twitter can potentially lead to millions of other sites that can create backlinks to your website. This means social media is, in fact, an important factor in local SEO success. That’s why it’s always recommended that you keep your social media profiles current and that the information on all your profiles is accurate and similar. This is especially true when it comes to contact details such as addresses and telephone numbers. Here at The Content Works we’re experts in all things SEO. 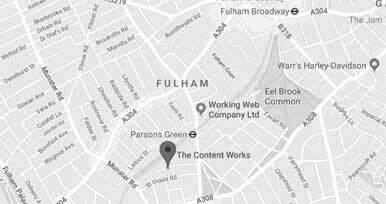 Take a look at our services to see how we can help you maximise your website’s potential or drop us a line on 0207 305 55 99 or email hello@thecontentworks.net. ← What is Black Hat SEO?